From scattered and unrelated parts come a single magnificent architectural work. Buildings are comprised of many separate things – woods, metals, ceramics, stone, glass and even plastics. Functionality, fit and finish are the qualities we look for in the craftsman’s art of joinery. Consider every visible place where separate components of the same or different materials come together to become part of the whole. How must these materials be fastened for sufficient strength? Will there be movement or varying stress at the joints? Is there any mechanical function provided by the joining of parts? And very importantly, how will it look? 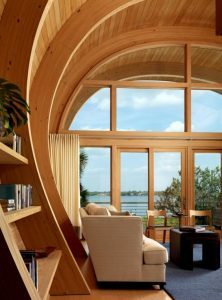 Elegant joinery should be beautiful and look like it belongs. What we are often dealing with here is a complex fabrication that looks like art. If there is one thing architects and general contractors understand it’s the value of great collaboration. Their businesses depend on it like no other. Without applying it, projects can easily end up over budget and take longer. Everyone needs to stay on the same page if they expect mutually assured project success. When the owner loves the finished work, everyone wins. Doorways, beams, archways, railings, shelving, windows, mechanical fixtures… How do you make all the parts come together elegantly? 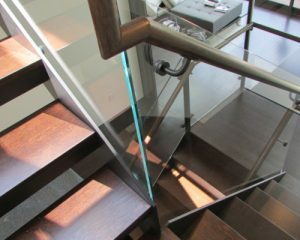 If complex metal fabrication is required to form a custom stair, for example, the architect needs a metals expert to help coordinate how to best join other architectural elements to the overall structure. You really need to get the craftsmanship right to avoid poorly fitting elements or something that just doesn’t look right. Perhaps your design calls for seamless joinery transitions that hide all welds, screws and fasteners. This may require that everyone involved in making the different parts, be they wood, glass, metal or stone will need to communicate with each other in a centralized and well-coordinated manner. Perhaps the woodworker, stonemason or glass cutter will need to create dowels or hollow out certain areas of their materials to accommodate hidden mounts and clamps. Thinking through the finer details of architectural joinery and then finding the right collaborators is one of the keys to successfully distinguishing your work from the run of the mill. If you have questions about a joinery challenge involving metal and other materials, feel free to call us at (603) 402-3022.